PowerPro-filer is a Linux utility that calculates Clock-Gating Efficiency as well as the percentage of registers clock gated in a RTL design block. Clock-Gating Efficiency measures the percentage of time a register is gated (turned off) for a given set of activity vectors. Since Clock-Gating Efficiency takes into account switching activity, it is a much better indicator of clock gating effectiveness and dynamic power savings. 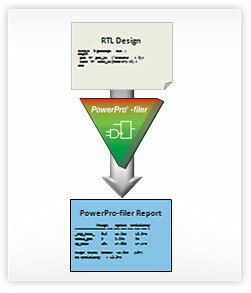 PowerPro-filer reads in synthesizable Verilog RTL and activity vector files (SAIF or VCD) in order to report how well your design is optimized for power. PowerPro-filer is part of Calypto's PowerPro product family which includes PowerPro CG and PowerPro MG.
PowerPro-filer is available for download FREE of charge. Firefox: Right click - Save Link As..
IE: Right click - Save Targat As..